There is good news about conflict! What? Yes! It can bring understanding about yourself, the situation, and the root cause. Conflict can even bring people closer together with a stronger confidence in building trust, respect and support with each other. It is common to say, “Conflict is inevitable!”… Duh. I say that a lot myself. That truth alone does not help with managing it, but it is a start. It is normal and healthy to have conflict. 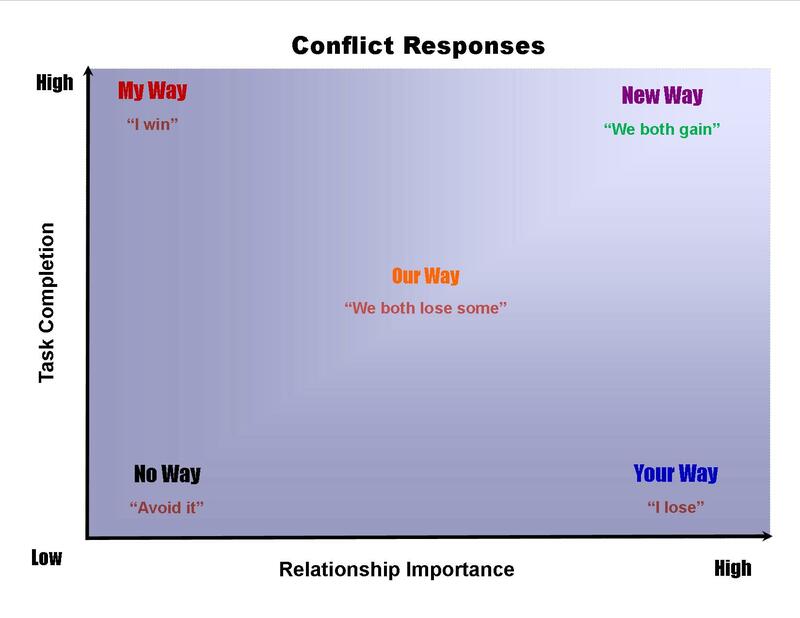 What we do with the conflict is very important for health within ourselves and in our relationships with others. Most people I meet have not been taught what I am about to share with you. I hope it becomes clear in the next few paragraphs, (with the help of the handy diagram I created) that you have five distinct ways to respond to conflict. The model is based on the good work of Thomas-Kilman and their Conflict Mode Instrument (TKI). They identified five main styles of dealing with conflict that vary in their degrees of cooperativeness and assertiveness. 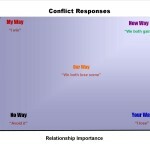 Their presupposition is that people typically have a preferred conflict resolution style. Before we go further I want to make an important point that each of the five conflict responses are useful in different situations. Not one of them is bad, or wrong in itself. When and how often you use it is important. The following definitions from the TKI will help you see the style. I have renamed them in my diagram as a fresh look at the well-worn terms used to talk about it. No matter what the label is, see if you can find the one that you most use. Once you know your tendencies, you can begin to explore what others use in your interactions with them. This information is vital to developing a conflict management strategy in your relationships. I will be glad to walk you through how to apply this to your situation. Give me a call. Avoiding (No Way): People tending towards this style seek to evade the conflict entirely. This style is typified by delegating controversial decisions, accepting default decisions, and not wanting to hurt anyone’s feelings. It can be appropriate when victory is impossible, when the controversy is trivial, or when someone else is in a better position to solve the problem. However in many situations this is a weak and ineffective approach to take. Competitive (My Way): People who tend towards a competitive style take a firm stand, and know what they want. They usually operate from a position of power, drawn from things like position, rank, expertise, or persuasive ability. This style can be useful when there is an emergency and a decision needs to be made fast; when the decision is unpopular; or when defending against someone who is trying to exploit the situation selfishly. However it can leave people feeling bruised, unsatisfied and resentful when used in less urgent situations. Accommodating (Your Way): This style indicates a willingness to meet the needs of others at the expense of the person’s own needs. The accommodator often knows when to give in to others, but can be persuaded to surrender a position even when it is not warranted. This person is not assertive but is highly cooperative. Accommodation is appropriate when the issues matter more to the other party, when peace is more valuable than winning, or when you want to be in a position to collect on this “favor” you gave. However people may not return favors, and overall this approach is unlikely to give the best outcomes. Compromising (Our Way): People who prefer a compromising style try to find a solution that will at least partially satisfy everyone. Everyone is expected to give up something and the compromiser (him or her) also expects to relinquish something. Compromise is useful when the cost of conflict is higher than the cost of losing ground, when equal strength opponents are at a standstill and when there is a deadline looming. Collaborative (New Way): People tending towards a collaborative style try to meet the needs of all people involved. These people can be highly assertive but unlike the competitor, they cooperate effectively and acknowledge that everyone is important. This style is useful when you need to bring together a variety of viewpoints to get the best solution; when there have been previous conflicts in the group; or when the situation is too important for a simple trade-off. Ideally you can adopt an approach that is appropriate for the situation, addresses the problem, respects people’s legitimate interests, and leads to mending damaged relationships.